Urif is a small Palestinian village perched on the top of a hill, not far from Nablus. The view is beautiful and clear, overlooked by another scenic hill. A longtime resident tells us that before the 1980s, the locals used to go for walks and picnics in the area, but since the illegal settlers seized it, it has not been possible or safe to walk in this area. No one would dare go too close to the area because the settlers are very dangerous. 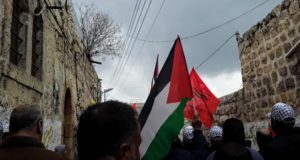 “The most dangerous of all the West Bank, with those of Kyriat Arbat, in Khalil [Hebron]” says the guardian of the school we met. 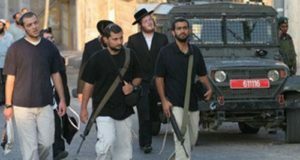 He adds that settlers from Kyriat Arbat come to join those of Yitzar to attack the surrounding villages on a regular basis. Established in 1983, Yitzar is home to a religious extremist community that has expanded in recent years. The arrival of young settlers has increased the attacks over the past five years. “And it gets worse from year to year,” he explains. The Israeli authorities’ dismantling of the Baladim forward post in June 2017, considered too violent and extremist even by the Israeli authorities, led to an influx of young settlers in Yitzar. However, they do nothing to prevent recurring criminal attacks against Palestinians. In Urif, the last building of the village before the colony, is the boys’ college. So here you never know if students will be able to study until 1:30 pm, the end time of their school day. Ayed Al Qot, the director of the college explains that since September, the staff has been forced to evacuate the establishment seven times. The situation is worse than last year. 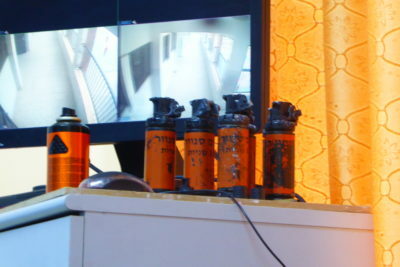 Behind his desk are tear gas bombs, sound bombs and rubber coated steel bullets collected from the school courtyard. He keeps them there as evidence of their painful, absurd daily life. Sound bombs, rubber coated steel bullets and tear gas canisters. Every day, there is always an overwhelming anxiety at the thought that the settlers may arrive and throw stones at the college. In these cases, the guardian of the establishment warns the teachers, the Palestinian Ministry of Education and contacts the inhabitants of the village and the Palestinian Police (who never comes, he adds). The students return the stones at the settlers and the inhabitants come to join them to defend the school and the village. Soldiers who watch the settlers attacks from afar come to suppress the Palestinians’ response. Tear gas, sound bombs, rubber coated bullets and even live ammunition. 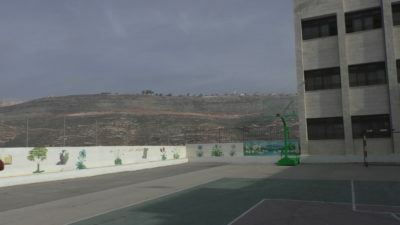 Less than two weeks ago, fifty settlers attacked the school. Several students were shot and wounded and taken to the hospital. 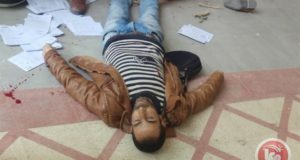 It’s hard to know if the shootings came from settlers or the army, says Ayed Al Qot. One thing is certain, killing people does not seem to be a problem for these settlers, and it has happened several times. 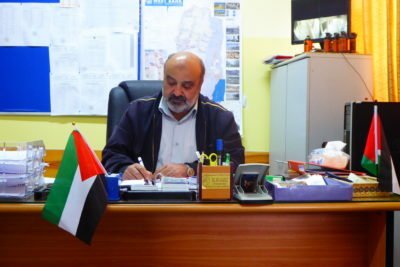 Ayed Al Qot, the director of the college in his office. Last Monday, it was at dawn that they attacked, which resulted in the school not even be able to open. The clashes lasted more than five hours. So in the face of these constant attacks, school drop-out is high, much higher than in other villages, explains the director. And the program is hard to keep. When the school is attacked, classes are cancelled and students are sent home. During class, young boys find it hard to concentrate, paying more attention to movements from outside than from their teacher. The teaching team is therefore considering alternatives to ensure that they can follow all the lessons; give lessons in the afternoon and on weekends in the center of the village for example. She would also like support to build a security fence and install a roof over part of the playground. So many solutions being put forward, but in the face of a situation where nobody is there to protect the students and put an end to the terror policy of the young settlers, it is hard to know what can really be done to stop the attacks. Some parents surrender and decide to change the school their child attends, but this is not an option for many of the parents. Everyday, the guard makes a tour of the college before the students arrive to be sure that no colonist has entered. When the classes begin, he places himself on the roof of the school or on the road in front of the building. Teachers regularly ask him if the settlers are on the way, constantly worried. This makes is difficult for the students to study but also for the teachers to teach affectively in such an environment. 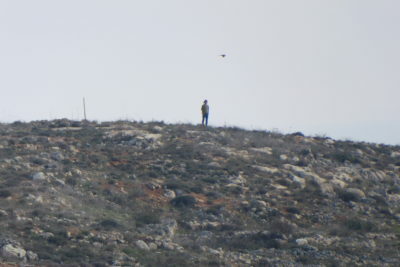 A settler scouts a Palestinian school in Urif, to prepare an eventual attack. That day, we see settlers at the top of the hill. The guard warns residents and the information circulates quickly. Cars go back and forth to see the evolution of the situation. A parent tells us that he leaves his job almost daily to come, as soon as he learns that settlers are in the area. Difficult to imagine the daily life of these people, immersed in endless waiting. Several hours pass, a man from the security service of the colony observes us from the hill, armed. There are silhouettes of settlers, sticks in hand, then they disappear. The wait continues. At 13:30, the school bell rings, luckily they have not been attacked today, leaving a little respite to the students, teachers and parents. In Palestine, time seems sometimes suspended. People are constantly waiting. They are waiting for settler attacks, without knowing when they will take place. They are waiting for the Israeli police to demolish their houses when they are built in zone C “illegally”, because of the lack of permits issued by the Israeli authorities. They wait at checkpoints, subject to the goodwill of Israeli soldiers to let them pass through. They are also waiting for the release of loved ones, sometimes without knowing when they will be released. Then of course there is always the expectation and hope that of one day their land with be liberated and free of the occupation.